"If Jackson Pollock, Preston Sturges and John Guare collaborated on a play, it might resemble THE DIFFERENT SHADES OF HUGH." THE DIFFERENT SHADES OF HUGH explores the complex and innermost madness and passion that lies within an artist and his process and how that fits within societal norms. In the summer of 2013, THE DIFFERENT SHADES OF HUGH was accepted into The Road Theatre "Summer Playwrights Festival 4." The play was read to a sold out audience and the reaction was so positive, The Road Theatre chose THE DIFFERENT SHADES OF HUGH to open their 2014 season. The Road Theatre on Magnolia - 1 week before opening. On January 24, 2014, THE DIFFERENT SHADES OF HUGH premiered at The Road Theatre in North Hollywood, CA. The play, scheduled to run six weeks, was extended to nine weeks based on the high volumne of ticket sales. Tom Musgrave, Coronado Romero, and Zachary Mooren. Zachary Mooren, Ellie Jameson, Tom Musgrave, Stephan Smith Collins, Whitney Dylan, and Coronado Romero. Clete and Craig just one and a half hours before the curtain went up for Opening Night. 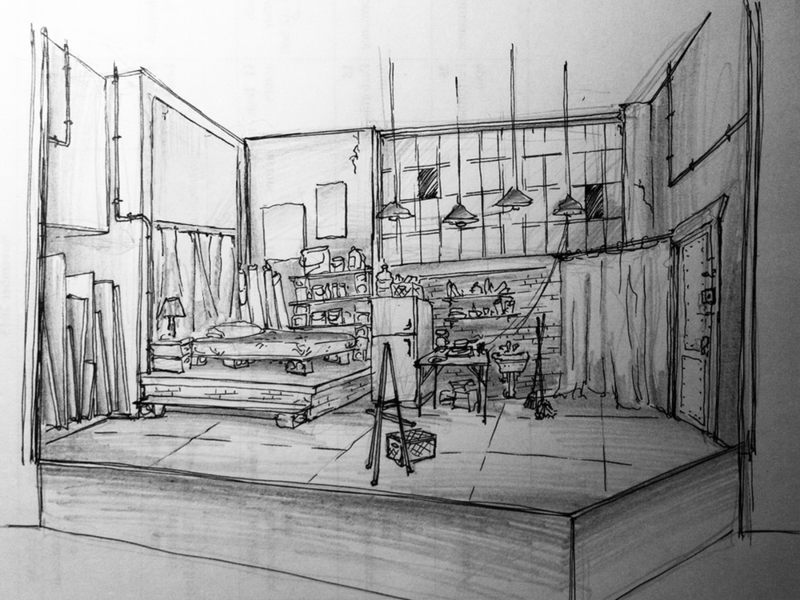 Rendering of set by Adam Flemming. Mock up of Adam Flemming rendering. Now the set is nearly ready. All the "tech" aspects of the play are coming together. Lighting is being placed and focused. The photos are being projected, and this photo of "Hugh" (Coronado Romero) is where he starts the play. Full set when lit. Coronado Romero during a break in rehearsal.